Women in Tech 2015 was a success. Co-sponsor Schibsted attended and met many interesting women who are making their mark in the Swedish technology and media industry. Many visitors to WIT 2015 came and talked about their future plans with Schibsted’s representatives. Many young talents were eager to learn more about the Group and took away copies of Schibsted’s Future Report. “It’s great to talk to tomorrow’s talent here and to see how eager they are to do something about the low representation of women in the technology professions,” says Schibsted’s Eva Idmark. 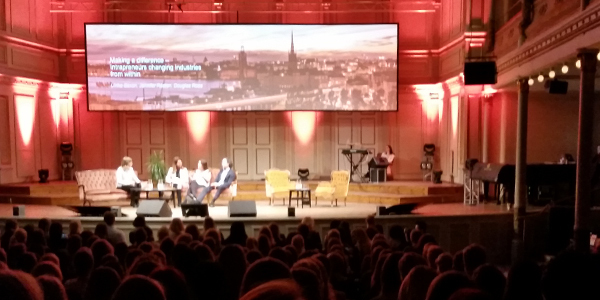 The line-up on stage was impressive, consisting of prominent business figures such as Mia Brunell Livfors, Ingrid Bonde and Annie Wegelius. We also saw YouTube star Clara Henry and the North Korean human rights activist Yeonmi Park. Despite the usual rivalry between WIM’s sponsors, they all pulled together again this year to help arrange the event. The aim of the event is to create equal opportunities in the Swedish IT sector. According to the TT survey of 49 listed IT and technology companies conducted last year, there is not one single woman in top management and only three board chairs. Male employees in Apple and Facebook account for almost 70 percent. The aim behind Women in Tech is to change this trend, and judging by the interest this event has generated, it is well on its way to doing just that.